MYAN concludes its coordination role with the Youth Transition Support (YTS) Community of Practice (CoP) this month. 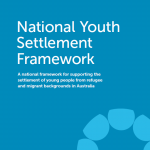 The Youth Transition Support assists young people from refugee and recently arrived migrant backgrounds to transition to their new life in Australia. YTS services provide young people with support to participate in employment, education, training, and sport. The providers that deliver the program in NSW, Queensland and Victoria have themselves been supported by a Community of Practice, established at the time that the YTS commenced. In late 2015 DSS requested that MYAN support the YTS by establishing a Community of Practice for the organisations delivering the service. Since 2016, the Community of Practice has met regularly, providing a platform for communication with government and independent evaluators, for resource and information sharing; common professional development; and general support and collaboration. MYAN has enjoyed its involvement in the CoP to date and thanks the providers and DSS for their collaboration over the duration of MYAN’s role. The YTS providers will now continue the CoP, taking on the management and coordination for themselves in 2019.